I’ve never been a huge jewellery wearer, but the few pieces that I do own never really had a proper home. Don’t get me wrong – I love a good trinket dish, but with my collection of trinkets slowly expanding, it didn’t seem practical anymore. It was time to find something larger to hold my favourite jewellery pieces. I did have a few criteria that needed to be filled whilst on the hunt for the right storage. I wanted the box to have compartments, but not excessively so, otherwise it all just gets a bit complicated. I also wanted it to be clear, just like my makeup storage, because that encourages me to wear the jewellery more often. And of course, it had to be pretty. It was going to be on display after all! So…I was browsing Oliver Bonas a couple of weeks ago and that’s when I found the perfect box. Medium sized, gold framed, glass panels with a mirrored base. What made it even sweeter was the student discount I got to apply on top. Voila! I had a beautiful new place to store my trinkets. The box has four compartments, three small ones and one longer section for necklaces/watches. The finish of the metal is lovely, a lightly burnished gold with no harsh corners or any signs of unevenness in the frame. 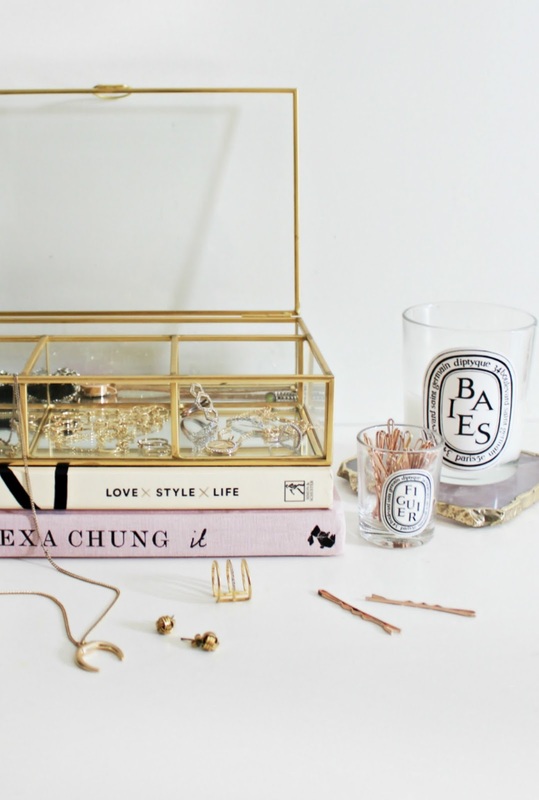 The mirror is perfect – it adds a touch of modern glamour to the box without making it look tacky. There is a little gold chain which attached the side to the lid (essentially, preventing the lid from shattering when you open it). The box also has velvet underneath, so that it doesn’t scratch any surfaces, and it also won’t slip. The jewellery box is available in two sizes; medium and large. I went for the medium size because I felt it looked a little cuter! The medium size is priced at £28 and the large size at £35. I also picked up this beautiful matching tray to house my most used skincare products (post coming soon)! 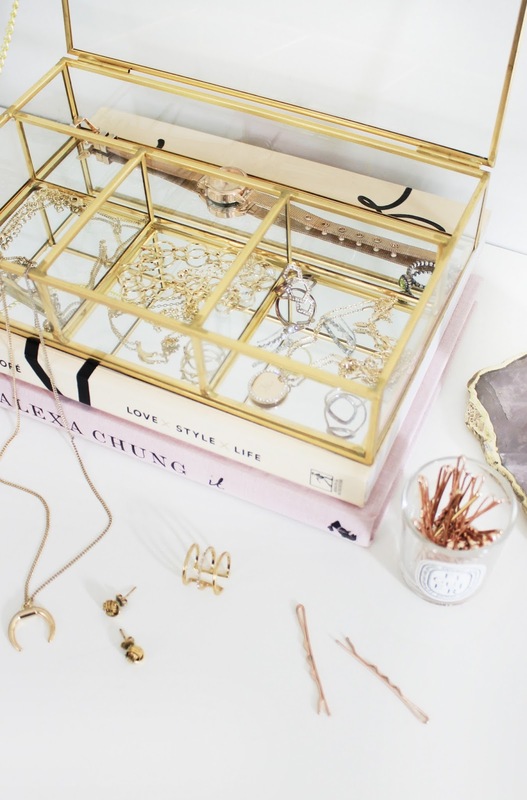 How do you like to store your most worn jewellery? Scenting Your Home This Season. Previous Post Four Ways To Find Inspiration For Blog Posts. Next Post The P.S… Bronze Highlight & Glow Kit.